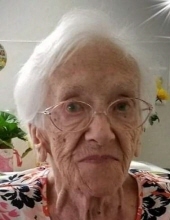 Dorothy (Hoff) Jarboe, 95, of Colchester, formerly of E. Killingly and Southington, loving wife of the late Thomas Jarboe, passed away peacefully on March 20, 2019 with her family by her side. Dorothy was born in Meriden, CT on March 8, 1924 to the late Albert and Augusta (Wilk) Hoff. After graduating high school, Dorothy worked in retail and manufacturing as she raised her growing family. She went on to pursue her passion for helping young children learn and received a teaching certificate from Briarwood College and began teaching at the Nursery School Program at Zion Lutheran Church in Southington. Dorothy received an additional certificate and worked her way up to become Director of the Nursery School, until her retirement, years later. Teaching young children always remained one of her greatest joys. Dorothy was also an active member of Zion Lutheran Church where she served as bookkeeper and accountant, member of the choir, and as one of the founders of the Southington Apple Harvest fritter booth. Additionally, Dorothy played a supportive role in her husband’s Sunoco Gas Station business serving as accountant and as partner in his passion for raising and training racehorses on their farm in the northeast corner of Connecticut. Dorothy enjoyed traveling, was an avid reader, soap opera fan, talented knitter, and was known for her delicious apple pie and banana bread. Most importantly, her family and extended family remained the center of her universe. Dorothy leaves behind her daughter Diane Kendrick (John) of Colchester, sons Thomas Jarboe Jr. of Colchester; James Jarboe (Barbara) of Putnam; and Gary Jarboe (Amy) of Plainville, brother Howard Hoff (Marilyn) of Florida, grandchildren Robert Bushnell (Lisa) of Clinton; Robin Gardner (Joseph) of Putnam; Meghan Gaignard (David) of Avon; Erik Jarboe (Lia) of Haddam; James Jarboe Jr. (Christina) of Southington; Justin Jarboe (Alicia) of MA; and Kevin Kendrick of Colchester, 14 great-grandchildren (with one on the way), and many beloved nieces and nephews. Dorothy was predeceased by her sisters Lydia Cerrito, Ruth Oros, Eleanor Oberempt, Lillian Hoff, and brothers Albert Hoff and Robert Hoff. The family would like to thank Harrington Court staff for their care of Dorothy. Visiting hours will be held on Sunday, March 24 from 4-8pm at Beecher & Bennett-Flatow Funeral Home, Meriden. On Monday, March 25 friends are invited to meet directly at St. John Lutheran Church, 520 Paddock Ave. Meriden at 11am for a service celebrating Dorothy’s life. Interment will follow in Gethsemane Cemetery. In lieu of flowers, donations may be made to a charity of one's choice. To send flowers or a remembrance gift to the family of Dorothy H. Jarboe, please visit our Tribute Store. "Email Address" would like to share the life celebration of Dorothy H. Jarboe. Click on the "link" to go to share a favorite memory or leave a condolence message for the family.